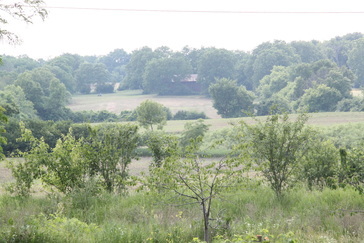 Our farm is located in Superior Township, just outside of Ann Arbor, surrounded by rolling fields and tall forests. As stewards of our land our mission is to preserve biodiversity, restore soil health, and strive towards implementing a sustainable farm ecosystem - in other words a modern day HOMESTEAD. As the number of small family farms in the nation are rapidly disappearing, we aim to nourish an endangered species, young farmers. We grow healthy food and watch as the soil in which it’s grown in comes back to life after generations of depletion. We take a special interest in soil health and the elemental composition of the earth.Through soil testing and analysis we are constantly learning what needs to be fed back to our fields. When the soil is alive with healthy micro-organisms, earthworms, oxygen and high carbon levels, the weed, insect and plant disease pressure will be significantly lower. And, when farmers farm with as much of a sincere interest in giving back to the soil as they have an interest in taking from it, the world will be a much healthier and harmonious place to live. We are very passionate about family, food and friends. Our farm concentrates on five areas of food production: vegetables, herbs, animals, fruit, mushrooms, and honey. We grow over 50 varieties of vegetables using organic and biodynamic methods. 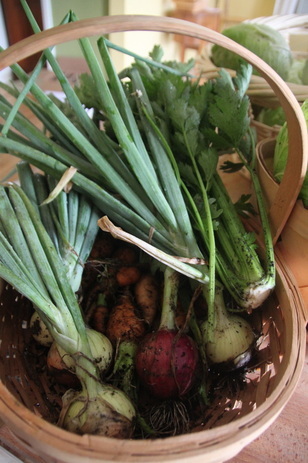 Our largest crops are heirloom garlics and shallots. We also grow more unusual vegetables and herbs like goji berries, ashwagandha, tulsi, and many variets or hot peppers. We raise pastured chickens for eggs and meat as well as a small herb of dairy goats for our milk, cheese, butter, yogurt, and soap. Having animals on our farm mimics a sustainable ecosystem helping us create a closed system of heirloom farming. The animals provide fertility for the soil, food for the community and helps keep the insect population under control. We have two small orchards planted with young fruit trees and one establish Island Orchard with mature apple and pear trees. Raspberries, strawberries, elderberries, and blackberries are all found wild and cultivated on our farm. Under the shade of top magnificent pine trees is our young mushroom garden that is currently resting during its inoculation. In the back corner of our farm is Bee Alley where our natural Warre Hives produce some of the best tasting honey we have ever had.